Next: How Long Do Braces Take to Work? The term smile design has been recently introduced by cosmetic dentists as a term which describes a service delivered by them to those who regard to a smile as to an investment and an important part of the self-development process. Experienced cosmetic dentists are able to carry out many procedures which make your teeth beautiful. There are many techniques to make your smile look perfect: tooth shaping with dental veneers, implants where teeth are missing, crowns, bridges and more. In the smile-design approach it’s not one or two teeth which are visibly different from others that matter, it’s ALL teeth which undergo some form or level of treatment. In most cases several cosmetic dentistry techniques have to be combined. Like any other design process, smile design begins with planning. The smile designer will evaluate the current state and shape of their patient’s smile, and will develop a model of an “ideal smile” in consultation with the patient. The cosmetic dentist becomes a designer , drawing a design and engineering it. The comparison between the present and the desired state is followed by defining the set of measures to reach the latter. The dentist has to always give priority to functionality rather than aesthetics, which makes the job particularly hard, though modern technologies and dental filling or orthodontic materials have advanced significantly improving the ease of work, comfort for the patient and durability of the effect. 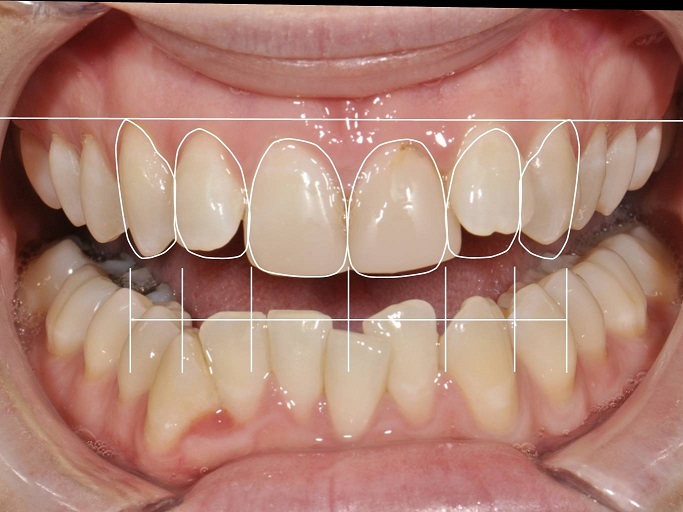 For designing, cosmetic dentists specialising in smile design can use visualization tools such as Photoshop and computer software packages specially developed for that purpose. Some of the most modern software will make comparison with the present and the desired smile look and will assist the dentist in the designing process effectively. The smile design process can be carried out remotely, though you have to use high-quality, high-definition photos of your smile and teeth in several positions to submit to the designer. However, remote smile designing is still being pioneered and most cosmetic dentists still recommend that the whole design process is carried out in-clinic. The second phase, which is the work on the patient will follow once the measures are defined and the cost is reported to the patient. If the patient agrees, the dentist will draw a plan with all measures required – treatments, durations and other important considerations which will be notified to the patient. The whole procedure may look complicated, but it’s aimed at high standards of aesthetics, functionality and safety for each patient.